While working on a postgraduate research project on ‘Pharmacovigilance in Africa’ through a grant from The University of Ferrara Italy and utilizing resources available at Queens University in New York, our founder Eric became increasingly aware that besides the safety concern of the drugs marketed in Africa, access and cost were major issues to address. The average life expectancy is 63 years mainly due to infant mortality and lack of management of chronic diseases like hypertension, diabetes and many others. One frequent trips to Africa during the project, he realized that most drugs commonly used to manage these chronic conditions were either unavailable, substandard or very pricy due to inefficiency in supply chain, lack of inventory management or unscrupulous middle men price hikes. from production to commercialization in order to realize his vision of bridging the gap in pharmaceutical care and access between developing and developed countries. 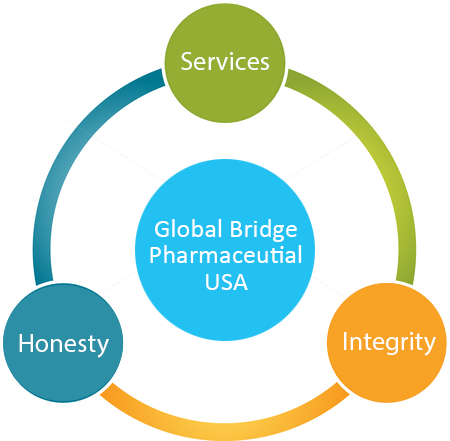 Global Bridge Pharmaceutical was incorporated in Delaware with main office location in Charlotte NC. In the last few years we have built tremendous relationships not only with manufacturing and quality control laboratories partners but also with clients and distributors in different parts of the world. To collaborate with health-care professionals and stakeholders both here in the United States and around the world, building meaningful relationships and providing solutions to their pharmaceutical and therapeutic needs. To provide access to the same quality and safe medicines available in the United States to patients, pharmacies, hospitals, and wholesalers around the world. To enable abundant access to more therapies for more people at a lower cost than is currently the norm. Patients in other countries should benefit from the same medicines and therapies available to those in the United States. Pharmaceuticals should have no borders. Health-care professionals and their staff should have access to the same pharmacotherapy solutions and training available to their peers in the United States and other developed nations. We want to disrupt the status quo and create tools our clients can utilize to realize their own vision.